New store will be the “go to” space for consumers to connect with the Huawei brand, their latest technologies and their products, at a more personal level. Dubai, United Arab Emirates – 6th November, 2017: Huawei Consumer Business Group (CBG), today announced that its first 'Experience Store' in the United Arab Emirates (UAE) is now open at The Dubai Mall. The store offers consumers a full retail experience, which includes access to Huawei’s latest products and services under one roof. All new products will now be available for pre-booking and sale at the same time as its global launch. The opening of the first brand store in the Middle East and Africa represents Huawei’s commitment to the region and the next step in the company’s mission to deliver breakthrough technologies, provide exceptional customer service and set new industry standards in innovation. Huawei’s goal is to become an end-to-end solutions provider, offering consumers more convenient and smarter ways to connect the various aspects of their lives. The new experience store will be Huawei’s main hub for it is regional fans and consumers to get hands-on the latest innovative products from their brand of choice. Last week seen the first regional sale day of very much anticipated Mate 10. Huawei fans lined up outside the new Huawei experience store to be one of the first customers to get their Huawei Mate 10 in the UAE. The sleek and futuristic design and layout of the 1,312 sq ft store offers customers a perfect space to explore Huawei’s ultimate intelligent Mate 10 and Mate 10 Pro. Pre-booking of the Mate 10 Pro will be available from the 13th of November in the store. The ‘Experience Store’ also features a dedicated kids’ zone, where they can experience Huawei Kids’ media pads, which combines play with learning to keep the little ones entertained. 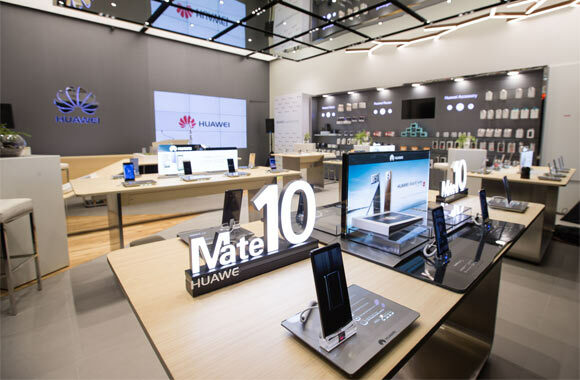 The store also compliments Huawei’s existing service centers in the region where customers receive assistance and shorter service cycles for their devices. The store is open daily from 10am – 11pm, Sunday to Saturday, and is located next to the metro link corridor on Level 2 of The Dubai Mall. For more information on new product launches and exciting offers, stay tuned to all Huawei’s social media pages.